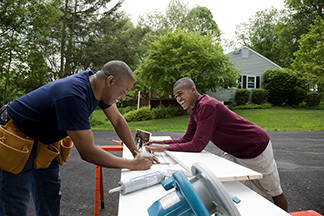 Build a new home or fund major additions or renovations to your current home with an LGFCU Construction Loan. At LGFCU we make it easy for you to manage the cost of major construction projects on your home. With a Construction Loan, the funds are advanced to cover costs as the work progresses. You can use the loan to build your primary home or a vacation or second home, but the property must be located in North Carolina, South Carolina, Virginia, Georgia or Tennessee. LGFCU Construction Loans are established with a six-month or nine-month construction phase. Once the construction is finished, your loan converts to either a Fixed-Rate Mortgage or a Five-Year Adjustable Rate Mortgage. Payments begin according to the terms and interest rate set previously at closing. The mortgage origination fee is.75 percent of the loan amount with a cap of $1,500. Choose a way to request your Construction Loan.